Made in a cool ankle-high length, these ladies ToeSox Minnie Sports Full Toe Socks are all-sport socks with five toe construction that is designed to improve your freedom of movement, posture and stability by allowing the toes to natural spread during movement. The weave includes vented bands to improve breathability and cooling. 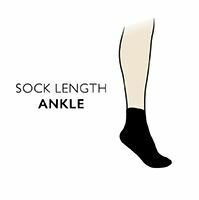 The socks have secure dual welt bands to keep debris out, a vector heel cup for optimal fit and a mid-foot arch band, applying gentle pressure to lift and support the foot. The seamless toe pockets remove moisture, eliminate friction and stop blister forming between toes, also protecting against athlete’s foot.